Until Dawn has a sizable cast of characters, but there’s one in particular who stands above the rest. 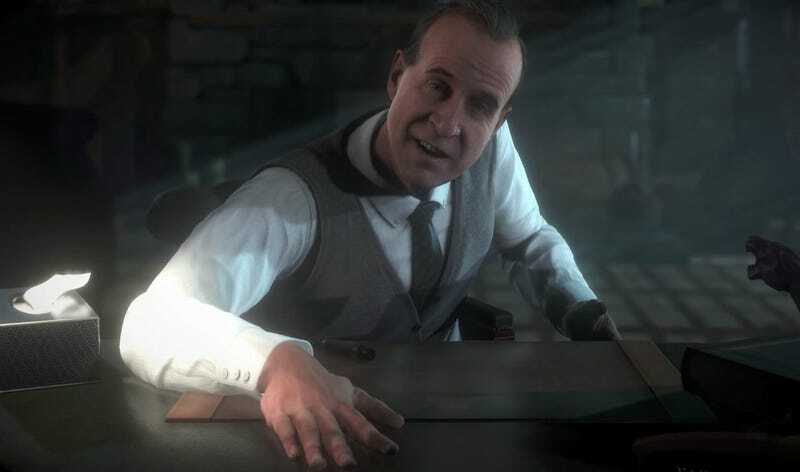 Dr Hill, played by the distinctly disturbing Peter Stormare, appears in between the game’s regular chapters to conduct a little psychoanalysis, quizzing the player on their fears and feelings much as any shrink might. He doesn’t play by the book for long, though, tearing into you for causing the pain the rest of the game’s cast suffers. Directly or indirectly, you are the one delivering them into despair, toying with their emotions for the sake of your own entertainment. These accusations serve a narrative purpose that becomes clear later on, and while it’s a neat twist, the real value of Dr Hill’s scathing rebukes comes from their broader application to the entire medium of video games. Rarely do we stop and question the role of the player in perpetrating a game’s narrative. We attribute the progression of a linear story solely to its creators, rather than the player driving it along. Even in choice-driven games like Until Dawn, we tend to see only the options presented on screen, rather than the full extent of the agency we possess. At any point in any game, the mere act of playing constitutes a decision, a willingness to be an active participant in the narrative being told. Unlike the passivity of a movie, a game will not advance without the player’s input, making them not just complicit in but necessary to the events that transpire. This is as true for paging through a visual novel as it is for blasting through alien hordes. Whether or not we agree with the actions of a game’s characters, the buck stops with us. It is our fingers that rest on the triggers, even if the targets in our sights were not of our choosing. Think about it. When we run Mario off a ledge, we kill him. When we walk Joel from The Last of Us into a trap, it doesn’t matter that it’s part of the story, it’s still our fault for putting him in danger. And when we make a last stand as Noble-6 in Halo: Reach, it is our inability to survive that gets the Spartan killed, even if their death is inevitable. We may only be following a predetermined script, but it is still on us to execute its lines. Sometimes, the course a game wants us to follow conflicts with our desires. Sometimes all the branching paths are unappealing, and just the act of going forward is undesirable. But that’s true of life, too. In life, though, you don’t have the luxury of shifting responsibility onto a digital avatar like you can in games. This get-out-of-jail-free card can be used to transport us into situations we could or would never get into in real life, but it can also diminish the impact of the narrative we’re enabling. It’s a running joke that Nathan Drake of Uncharted fame oscillates between wise-cracking goofball and bloodthirsty mass-murderer, but the fact that it’s the player directing his slaughterfest always seems to go unmentioned. Similarly, the fact that Call of Duty, a series focused on violent warfare, can be played without ever firing a gun is something that the vast majority of players will never know. The truth, though, is that we almost always have a choice; it just takes a little more effort to find it. Scant few games have truly explored this idea of player culpability. Spec Ops: The Line stands out for the guilt evoked by its white-phosphorus scene , as well as its focus on the conflict between personal values and formal orders. Bioshock is similarly piercing in its critique of free will and submission to authority. The Stanley Parable is framed entirely around the notion of obeisance, demanding that the player disobey its rules in order to make any tangible progress. Sadly, though, these games are the outliers, their voices drowned by a chorus preaching absolution for the player regardless of their role in a game’s tragedies. This mentality clashes with the goal of immersion that most games pursue. We are supposed to embody our digital avatars, empathising with their plight and sharing their motivations. Yet at the same time, we distance ourselves from the methods necessary to achieve their goals. Lying, stealing, killing; these are crimes committed by the characters on screen - them, not us. It doesn’t matter that it’s our hands on the helm. Rather than confronting our complicity in behaviour that contradicts our morals, we write ourselves into and out of the narrative as we see fit. Consistency comes second to preserving peace of mind. Despite the prevalence of this fair-weather demeanour, recognition of its incongruity is practically non-existent. When Batman grinds a thug’s face into the concrete with the wheel of the Batmobile in Arkham Knight, we chastise the caped crusader for his brutality but ignore the fact that we made him do it. When Chris is forced to make a terrible sacrifice in Until Dawn, we justify it based on his motivations, divorcing ourselves from the horrible consequences that follow. By downplaying our accountability, we weaken the power of the interactive medium. Games should be able to make us uncomfortable with our decisions, forcing us to question the strength of our morals in the face of obstacles we cannot avoid. The characters we control are vessels for our investment, not dumping grounds for unwanted responsibility. Of course, it would be foolish to weigh the life of a fictional character on the same scale as a flesh-and-blood human being, but that doesn’t mean our attitudes towards incorporeal entities are irrelevant. Fictional characters are typically designed to be as real as possible, with flaws and feelings that we can relate to. Well-written characters can generate the same empathy evoked by friends and family, no less intense for the absence of autonomy. Just look at the reactions to the end of Season Five of Game of Thrones, or the fallout after the final episode of any popular TV show ever made. Fiction isn’t take; reality is what we make it. When we can care just as strongly about individuals born of imagination as those formed in a womb, our in-game behaviours take on far greater potency. To hurt a fictional character that we’ve grown attached to invokes the same feelings of pain and regret that the act would in real life - albeit to a lesser extent. Scenes like Ethan Mars’ self-mutilation in Heavy Rain and Lee’s sacrifice in The Walking Dead stimulate real emotion, hitting all the notes the incidents would had they occurred in the physical world. Despite being dulled by a screen of artificiality, the image in our heads is as clear as day. The line between fiction and reality is only getting thinner as technology advances. Every day, the virtual world gets closer and closer to the physical one, both in terms of simulation and interaction. Consequently, the notion of culpability in the digital space is becoming more than just a narrative concern. The smaller the gap between avatar and self, the less valid the excuse of ‘but it’s not real!’ becomes. As it is now, we’re primed to think that the virtual domain operates by a different set of rules to reality, and it’s going to be tough to overcome that attitude when entertainment is no longer the primary purpose of jacking in. Shooting a digital avatar currently doesn’t feel like a crime, but what happens when that avatar is a real person’s entire life? Invalids, trauma victims, and the chronically depressed may one day live solely in virtual reality; imagine the damage ‘virtual’ violence could cause them. Sometimes it pays to reflect on our roles as players. We are not passive observers; our actions dictate the course of a narrative, even the linear ones. Laying the blame for violence and death on characters dependent on our input devalues the symbiotic storytelling games alone can engender. Every command we issue is a choice. We choose to keep playing, and thus we must take ownership of the consequences. Games can teach us valuable lessons about ourselves, but only if we are willing to embrace them without restraint. So long as we continue to wash our hands of the actions we take in the virtual world, the greatest potential of the medium will remain unfulfilled.